The Trojans are still adjusting to playing the role of favorite. A game after blowing a 22-point second-half at Washington on Sunday, USC (13-3, 2-1 in Pac-12 play) let a 15-point lead in the second half dwindle to two before a 10-0 run in the span of a minute closed out the feisty Arizona State Sun Devils (10-5, 0-2), 75-65. A game-time decision after injuring his ankle in Seattle, junior point guard Julian Jacobs had 15 points to lead the Trojans, while freshman forward Bennie Boatwright had 14 while sophomore guard Jordan McLaughlin chipped in eight assists. The Trojans exceeded their 12 wins in 2014-15, and improved to 10-0 at home heading into a Saturday clash against Arizona that will see the most energetic Galen Center crowd of the season. Find out what we learned on Thursday night. 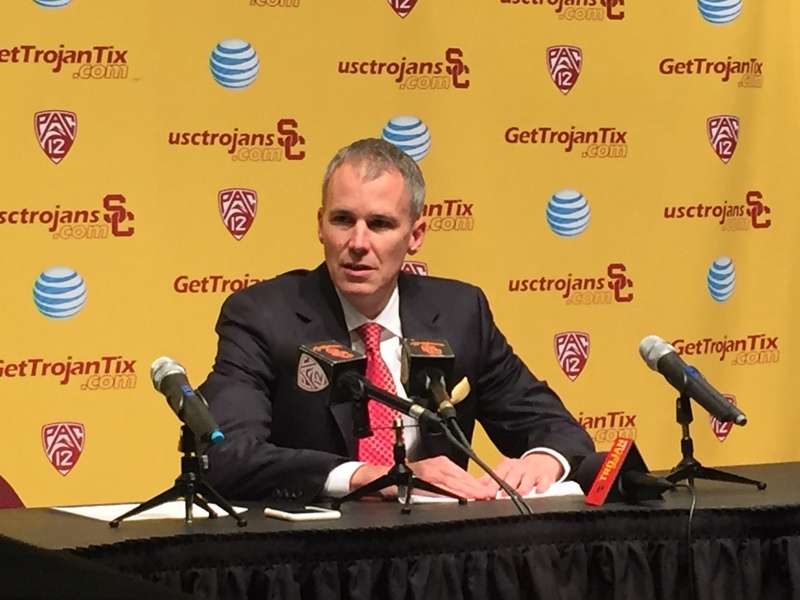 The Trojans won Thursday, but coach Andy Enfield was less than pleased on the near-collapse. USC looked to be cruising to a double-digit win…until the Sun Devils starting scorching it from the field. After USC took a 65-55 lead with 3:12 to go, Arizona State guard Tra Holder went on a personal 8-0 run, keyed by a pair of threes, to cut the Trojans’ lead to two with 1:49 to go. After blowing a 22-point lead against Washington, a second straight crushing loss looked to be in play…until the fast break took over. 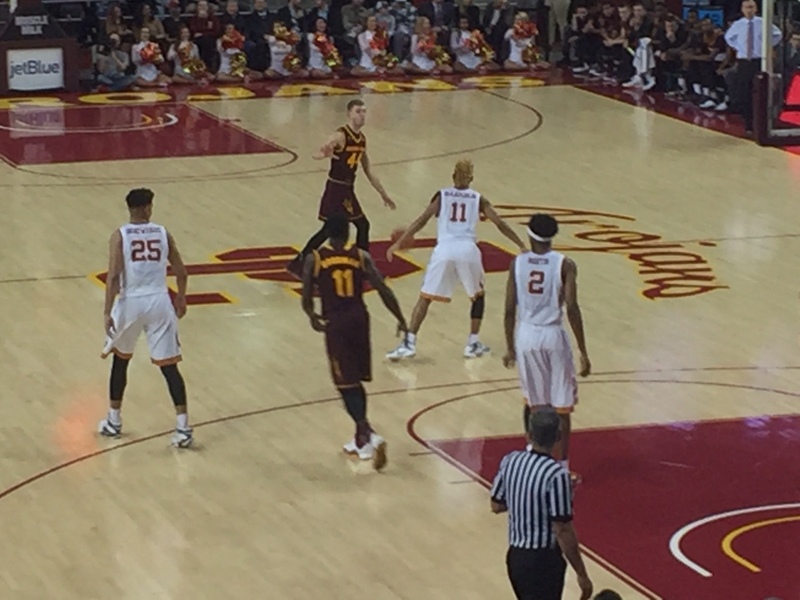 The Sun Devils then missed three straight three-pointers in quick succession. The first led to a Metu slam on the fast break from Jacobs, the second resulted in a Katin Reinhardt layup and the third ending with Jacobs scooping it in to push USC’s lead to 71-63. Darion Clark, a 40 percent shooter from the line, hit a pair of free throws to push it to 10 to eliminate any doubt. The game was closer than the final score indicated, but the Trojans did notch their second double-digit conference win of the season. Darion Clark is still looking for his offensive touch after a season and a half on the court for USC, but his aggressiveness on the boards is keeping him on the floor. With USC up 14 with 12 minutes left, the 6-foot-7 forward snared an offensive board, missed his first attempt, then got fouled on his putback attempt. Less than two minutes later, Clark timed his jump perfectly on a Malik Marquetti miss for an easy putback. He even provided some fire on the bench, giving a festive salute to Elijah Stewart after Stewart hustled to deflect the ball off ASU’s Gerry Blakes to force a turnover shortly after. You’ll get a better angle than Enfield. “I saw an arm about two feet above the rim. That’s all I saw,” the coach said when asked about the slam. The Achilles’ heel of this Trojans team continues to be offensive rebounding. The Trojans are athletic, but sometimes look like a trampoline at a fourth grade birthday party with bodies flying everywhere. USC’s two freshman, Boatwright (25) and Metu (2) still have work to do on the boards. On a Sun Devils possession midway through the first half, Andre Spight scooped his missed jump shot, missed a layup, then grabbed a second straight offensive board before laying it in while being fouled by Elijah Stewart. He missed the free throw… which was rebounded by the Sun Devils’ Eric Jacobsen. Later in the opening half, the Trojans blocked two straight Sun Devil shots before a missed tip-in by Jacobsen gave USC the ball back. While USC held the Sun Devils to three offensive boards in the second half, the Trojans allowed ASU to stick around longer than they would have liked thanks to a pair of costly offensive rebounds in the final five minutes. YOU Get a Three…and YOU Get a Three… and YOU Get a Three! The Trojans opened up a 9-2 lead with a trio of long-distance shots. The Trojans could only push that lead to 11-2 as the Sun Devils went 7:18 without scoring a single point, missing out on an opportunity to put the game out of reach early on. A key trait for USC to improve on is flashing that killer instinct that could have prevented the Sun Devils from hanging around for the entire half. The Sun Devils are no slouch, but stronger Pac-12 squads like Arizona won’t let USC off the hook as easily for not capitalizing on red-hot runs out of the gate. Reach Jacob Freedman here or follow him on Twitter. « Max Analysis: Is It Dunk City or Block City?